Cheers to LOCALLY produced milk that's served up subsidy-free! Our marketing system, supply management, is often misunderstood as it is often portrayed as a very complex and complicated system; however, it really isn’t. It simply is about keeping our food local in Canada. Instead of shipping large quantities of dairy products across the world, we look to Canadian farmers to fill the market. This allows us to not have to import nor export high quantities of dairy. Why is supply management good for Canada? There are tons of benefits to the consumers, to retailers, and to farmers. It keeps your milk LOCAL. With every carton of milk you purchase, you’re supporting local dairy farms here in Canada. It’s likely that your carton of milk came from a dairy farm near by. By supporting local farmers, it means that you’re supporting people in your community. It also means your milk doesn’t spend days on a tanker being shipped from thousands of kilometers away. It keeps your milk AFFORDABLE. In report after report, it’s proven that moving away from locally produced milk doesn’t mean lower prices at the grocery till. For example, Australia moved away from supply management and it ended up costing consumers MORE. The prices temporarily went down, but rose back up to more than where they started a short time later (Boston Consulting Group). Prices in Canada are comparable to costs around the world. In the USA, the price of milk is $1.63/L and here in Canada the cost is $1.51/L (AC Nielsen, 2017) for a comparable, synthetic hormone-free version as added hormones are illegal here in Canada. Check out the Global Action Report for more details. What’s important to note is that you only pay once for your milk here in Canada: at the till. In every single other country you’re paying twice, once at the till and again through your taxes. We think that money is better spent on roads and hospitals rather than having to subsidize dairy farms. It supports our Canadian ECONOMY. By sourcing your milk from local farms, those benefits trickle down to local economies. Canadian dairy farms contribute $19.9 billion towards the GDP and provide 221,000 Canadians with jobs. There’s less WASTED FOOD. Quotas are a way we manage supply and demand. They ensure that our farms are producing the right amount of dairy for Canadians; no more, no less. By ensuring that our farms don’t flood the market, there is less wasted milk. Countries that do not have supply management resort to dumping perfectly fine milk simply because there is no market for it. There are three pillars of supply management that ensure that our system works effectively. Using a quota system, producers can ensure that a steady supply of quality products are available to meet consumer demand. Canada’s federal government has committed to limit imports to ensure Canadian dairy market requirements are primarily met by Canadian milk production. Dairy producers receive prices that provide a reasonable return, which enable producers to cover production costs. Our producers do not rely on taxpayer subsidies. Looking to find out more about the facts and myths surrounding the dairy industry? Looking to access our library of downloads and resources? 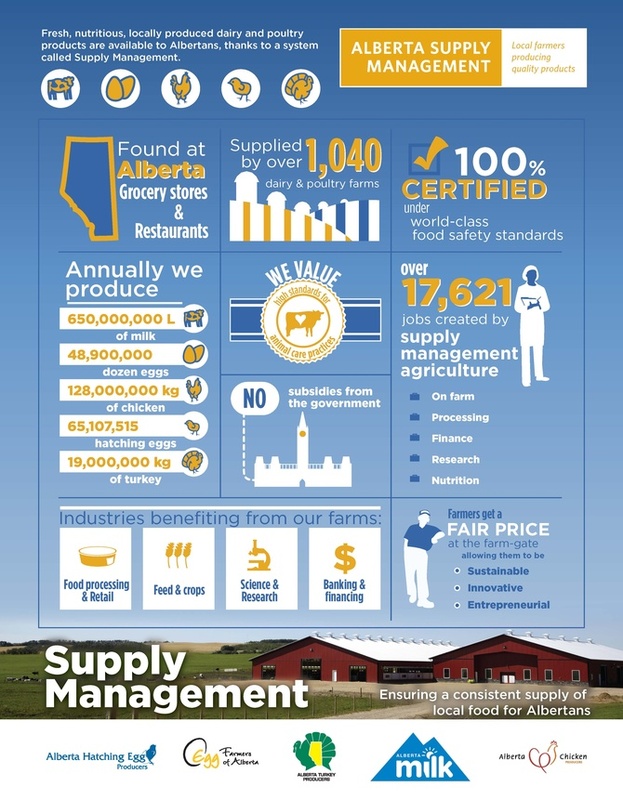 Are you looking for more information on supply management? Or, contact corporate communications at 780-577-3305 and we can help answer your questions.